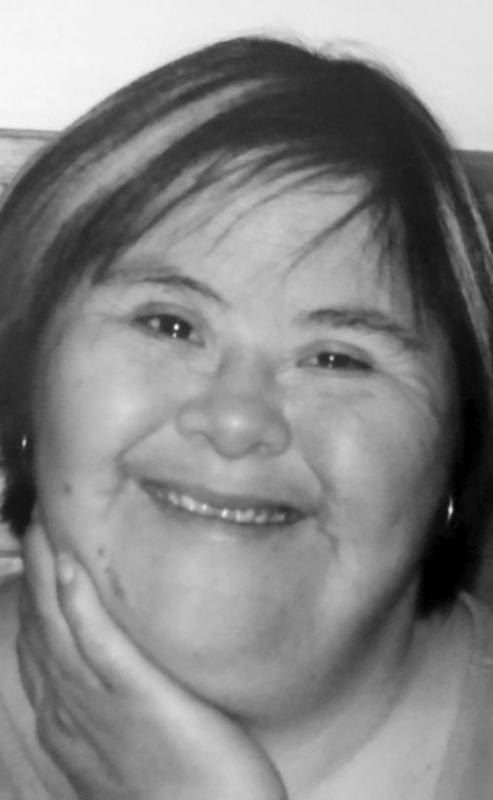 Our precious Angel Lynn Carmen Healy “Awakasiipita – Deer Old Woman” passed away peacefully with her family by her bedside on Wednesday January 30th 2019 at the age of 54. God sent one of his Angels to Art and Clara Healy on October 29, 1964, she was the third child of 7 children. Lynn’s handicap never stopped her from achieving anything she put her mind to. She had many accomplishments and a variety of interests that kept her active. Lynn was a character, everyone that knew her had a chuckle and a story to share. Lynn had a variety of friends’ that were young and old and from far and wide. She remembered everyone that came into her life. Her passion for music varied greatly from country to rock and roll to gospel and traditional pow wow music. Attending concerts was her favorite pastime and she had gone to see Johnny Reid, ABBA and Paul Brandt. Terry Clark was her favourite female country artist and she emulated her by wearing her pink hat and boots which she loved. Lynn enjoyed music so much and thoroughly enjoyed singing beautiful gospel music with her sister Denise. There was no way that Lynn could pass by a catchy tune without breaking into a dance. Lynn attended Dorothy Gooder School and graduated from Winston Churchill High School in Lethbridge. In her early years Lynn lived in Lethbridge with Sandra and Roxie under the care Margaret vanBiert. Lynn travelled to Holland for a month with Margaret and the girls where Lynn captivated the hearts of the people of Holland and they wanted to keep her. Lynn was independent as she rode the bus to her place of employment at DaCapo Disability Services where she was the postmaster. She was very active and participated in the Lethbridge Handicapped Riding Association and was talented in swimming and bowling. She received numerous medals and trophies from her various activities. When Lynn moved home she became involved with the Blood Tribe FCSS Handicap program where she worked in the Food Bank. Later on she transferred to the Cardston Handicapped Society. While there she was the main star in the play “The Princess and the Dragon”. Lynn stole the show and the people were amazed by her performance. Lynn never played favorites with anybody and she demonstrated her love for everybody especially Santa Claus. Due to her declining health, Lynn spent the last few years of her life at the Special Development Unit in Fort Macleod. The family would like to thank the doctors and caretakers who took such great care of our dear Lynn while she was at the S.D.U. The family would also like to thank Cheryl Millward, Lynn’s respite home in Cardston, for the love and care she showed for Lynn. Lynn is survived by her mother Clara Healy her siblings: Kevin (Lori), Denise (Tyrone), Pam, Myron (Tanya), and Kurt. Nieces and Nephews: Brett, Mitch, Kristen, Tia, Joel, Darci, Clinton, Trent, Tiauna, Bailee, Latoya, Tory, Kalli, Darby, Brittany, DJ, Madison, Jaxon and numerous great nieces and nephews. Auntie and Uncles: Gilbert (Velma) Eagle Bear, Evelyn (Frances) Scout, Marsha (Merlin) Provost, Anita (Randy) Bottle, Nora Eagle Bear, Audrey Eagle Bear, Edna Many Fingers, Bella (Bert) Mistaken Chief, Lila, Patsy, Del, Heather, Sheila, Fern, Robert (Christine), Gilbert Healy, Jessalyn (Armand) Page. Lynn was predeceased by her father Arthur Healy Jr, grandparents Art Sr and Betty Healy, Mike and Angeline Eagle Bear. Brother: Dion Long Time Squirrel. Uncles: Winston, Jordan, Burton and Terry Healy, Alphonse, Vern, Michael Eagle Bear and Aunts Sylvia Eagle Child, Rita Tallman, Mildred Jerry, Louise Chief Body, Marie Hunt. Cousins Buddy Lane Healy and Tommy Many Fingers. Lynn comes from a large extended family: Pace, English, White Feathers, Eagle Bears and No Runners. We apologize if we missed anyone. A Family Service will be held at Legacy Funeral Home, Cardston on Thursday, Feb. 7th from 4:00 – 5:00 p.m. followed by the Wake Service at the Old Agency Community Hall from 6:00 – 11:00 p.m. The Funeral Mass will be held at St. Mary’s Catholic Church, Blood Reserve on Friday, Feb. 8th at 11:00 a.m. Interment in the One Spot Cemetery.